Quantum Lodge Motel Hamilton is a modern complex located at the northern entrance to Hamilton and right across from “The Base”. Easy to find and conveniently located close to the intersection of the three major access routes which service Hamilton City, Quantum Lodge Motor Inn is less than one and a half hours drive to downtown Auckland or the international airport. This accommodation will please even the most discerning travellers and is available at surprisingly affordable rates. 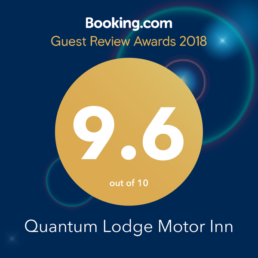 Setting a new standard for motel accommodation and service, Quantum Lodge offers a choice of studio units, 1-bedroom deluxe suites and 2-bedroom apartment-style family units. 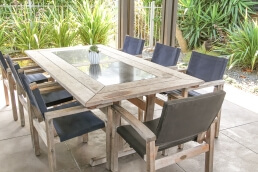 Constructed using the latest materials and techniques. 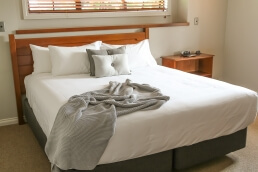 Quantum Lodge offers a comfortable and secure place to stay where you really can expect the best. Generous open-plan units furnished with either super king-size or twin queen-size beds. Larger unit with separate bedroom and deluxe spa bath. Apartment-style, 2-storey unit with 2 bedrooms, a separate lounge downstairs, 2 bathrooms and spa pool. 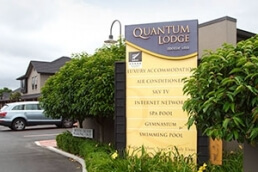 Located at the northern entrance to Hamilton, just off State Highway 1 (1 Karewa Place, Te Rapa, Hamilton), Quantum Lodge Motor Inn is very easy to find and less than one and a half hours drive from the Auckland International Airport.